Stand by Me has been caring for needy children in Nepal since 2010 in our hostel. On Saturday a devastating earthquake hit Nepal, causing destruction on a massive scale and the death of over 3,000 people. It is the worst earthquake to hit Nepal in its history. Homes, hospitals and schools have been destroyed and thousands of people are at risk. When the earthquake struck, many of our children were visiting their families for the Easter holidays. Our immediate concern is that while some have returned safely to our hostel, the great majority are still unaccounted for. Early reports inform us that many of the homes where our children come from, remote in the mountains, have been damaged or completely destroyed. In the town where we have our Stand by Me children’s hostel, many people have tragically lost their lives. Properties, including our girls’ home have suffered severe damage. Our children and staff are currently sleeping in tents in our compound. We urgently need your help to stand by the children, their families and their remote communities, to provide food, clean water, shelter and help them rebuild their lives from the rubble and despair. Through your incredible support to our Nepal Appeal, Stand by Me were able to make a speedy response to rebuild 40 houses for those made homeless in a remote village. Fay Garrett, our Nepal Coordinator, was able to visit this village district in October and meet many of the families who are benefitting from the homes, including Ram*. Ram is five and lived with his family in a home built from mud, stones and thatch. When the earthquake struck, his parents were away working in the fields of richer high caste people. Brave Ram did not panic but held his tiny sister’s hand and took her out into the open fields. Ram’s house was destroyed. We started building Ram’s family a new house that will provide them with shelter from the harsh weather and the dignity of having their own land and property. The house is nearly complete and the benefits will reach far beyond the protection of the bamboo walls but give them the knowledge that they are loved and cared for. Thank you for your continued support and prayers for the people of Nepal. Your kindness is helping to bring lasting change to families lives. When the earthquake hit a certain village in Nepal, all 102 homes in the village were destroyed and a landslide swept away all the rubble and everyone's possessions. The land became uninhabitable and 102 families were homeless. They travelled far as no one wanted them on their land until they came to a place where they set up temporary shelter. Laatri* lives in our Stand by Me Hetauda Home and her family is one of those homeless now living there. Thanks to the generous support to our Nepal Appeal our team reached this place and have been supplying the families there with food, clothes, medical supplies and cooking equipment. Before our help the families only had the clothes they were wearing and nothing else. Thank you for your amazing support and for standing by families who have nothing. Now that all of our children in Nepal have returned safely back to school they have been able to tell us their experiences of the earthquake. Here’s what Santosh* wrote in his own words “Me and Prem and my brother were coming to children’s home in bus. And bus was running but because shake, bus stopped, we ran out of it and stayed on open road. God saved us there nothing happened. Now our school was reopened and started new session. Thank you very much for your great help.” Thank you for your support of our children, their families and communities in Nepal through our Appeal. Thank you for your kind and generous support to our Nepal Appeal. This is one of the houses that you have funded, it’s awaiting plaster and nearly completed. The home will transform the lives of Samjhana’s family and we are currently building homes for many others. Thank you for keeping these families safe and protected from the monsoon and giving them a quality home for the future. Remember – It’s not too late to join us in building more homes as we stand by the people of Nepal long into the future. Our team in Nepal met Anisha* and her husband Kumar*. They have three children and Kumar provides for his family by farming goats. Binod was climbing a tree to collect leaves for the goats to eat when the earthquake struck, causing the tree to fall and Kumar to suffer an injury to his back. Their house was destroyed and now Kumar cannot walk properly or work to provide for his family, they had no means to feed their children and were feeling desperate. We gave Anisha and Kumar supplies and financial support, she was exceedingly grateful and thanked you, saying “Your help with rice and lentils and supplies is going to help my family survive for many weeks. Now we won’t starve to death. The money you gave for medical, we will be able to take Binod to the doctor. When he gets well he can start working again. We will be able to make a living again. We are very very grateful to the people who gave the help." Your fantastic support is enabling us to give lifesaving support to many more people like Anisha and Kumar. In terrible circumstances you have brought hope, thank you for your kindness. Thanks to your generosity we have provided relief a district in Nepal through our partners. This district was one of the worst affected areas and suffered the death of many people and total destruction of countless buildings. Our partner sent a team to a village and the team reported back and told us of the devastation the team found in the village that was unreached by any relief until they arrived. “We took three trucks with us. We had to cross three landslides on the way. We found out that 95% of the houses were destroyed. People had nowhere to live and no food. People were surviving eating leaves and plants from the jungle. It had already been three weeks and they told us we were the first ones to bring any help. They thought we were the government but we told them that we were from Church wanting to help people and show God’s love. It was very very heartbreaking to see these people not only without food but had lost many family members in the earthquake. Many told us they had lost their livelihood, all their crops were gone due to landslides and the earthquake. Everything was gone. We gave them double portions. We were able to take care of one hundred families or more. People had come down from other remote villages to receive help, they were carrying baskets so they could carry two bags of rice each. That was the most important item they received. Then they received lentils, sugar, salt, cooking oil, noodles, blankets, pots and pans, cooking utensils and plastic tents for roof over their head. When it rained before we came, they were just out in the open. They did not know how they would survive the monsoon if they did not get more help. The amazing response to our Nepal Earthquake Appeal has already helped hundreds of people in a remote area with immediate relief of food and tarpaulin. We will maintain the relief supplies for three months until the next harvest and are now replicating our relief work in the worst affected district. We have a plan! We are purchasing and transporting materials now to start building the first 50 earthquake resistant homes for people like Maiya's family (pictured above). Maiya is a seven year old girl who we care for at our home. Maiya’s parents have four daughters and grow rice. When the first earthquake struck, their house collapsed, it is now filled with rubble and is dangerously unstable. Maiya’s father suffered a stroke and is not physically well enough to work, he has no hope of rebuilding his house without our help. 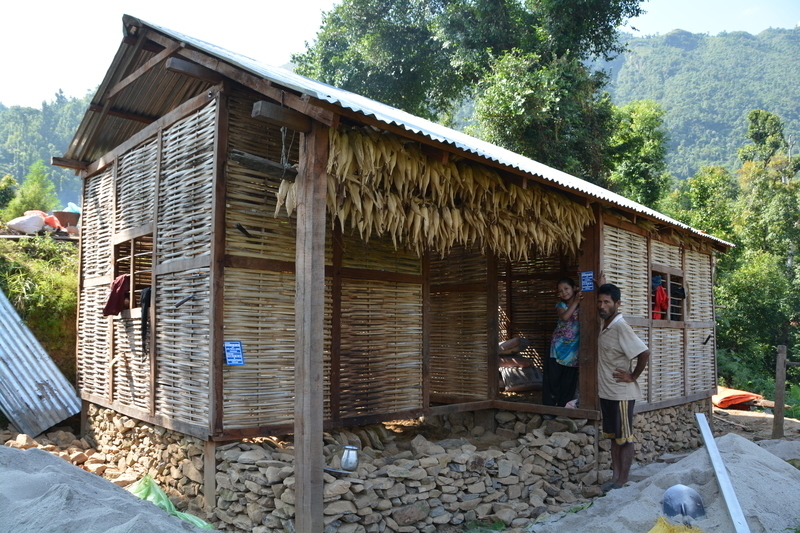 The new earthquake resistant homes will cost £700 each and provide security, protection and hope. There are many more families like Maiya’s, living under tarpaulin, exposed and in extreme need. It’s not too late for you to help. Every penny from our Nepal Earthquake Appeal will go to provide relief and long term support to people just like Maiya’s family. Our staff on the ground have been working tirelessly to take relief to the area where many of our children come from. 90% of homes in the area were destroyed leaving hundreds without shelter or food. After a tough journey our staff arrived there and made sure the essential relief reached the most at risk families in the community. Giving them tarpaulin for a tent and food supplies including rice, lentils, oil and salt to keep them sheltered, nourished and give them hope that they are not forgotten. Additional relief supplies are being purchased to support 250 families, while we assess the needs of other communities. Our aim is to provide families with building materials, tools, livestock, water containers and pots and pans so that they can rebuild their homes and lives. Today nurses are travelling to provide medical help to isolated communities. Please share this with the people you know so that we can continue to bring relief and hope for children, families and their communities. Thank you for your amazing support! We have been astounded by your generosity and kindness towards the people of Nepal. Please keep sharing our appeal, we are continuing to hear new reports of the widespread devastation caused by the earthquake. Families and communities who had very little to begin with have lost everything and they urgently need our help. We are still waiting to hear confirmation of the safety of many of our children. However, we have heard good news that a group of our children are endeavouring to make their way back to our home from the remote villages. We have sent staff to meet them as it is a long trip over the mountains on foot, four days walk at least, landslides have made the tracks impassable so walking the whole way is the only option. Once back at our home they will receive medical checks, food, shelter and lots of warm hugs! The funds we have received through the appeal so far are being used to help 150 families whose homes have been completely destroyed. Families are sleeping outside under the open sky, cold, wet and vulnerable. All their food supplies were stored below their houses that have collapsed and their food is ruined and inaccessible. Stand by Me staff have arranged essential relief to each family including a tent, foam mattresses and food supplies which will last at least 15 days. The cost of this temporary but vital relief is £30 for each family. It’s easy to see the terrible images of destruction on the news and become disheartened, but just £30 will help us stand by a family and bring them God’s love.